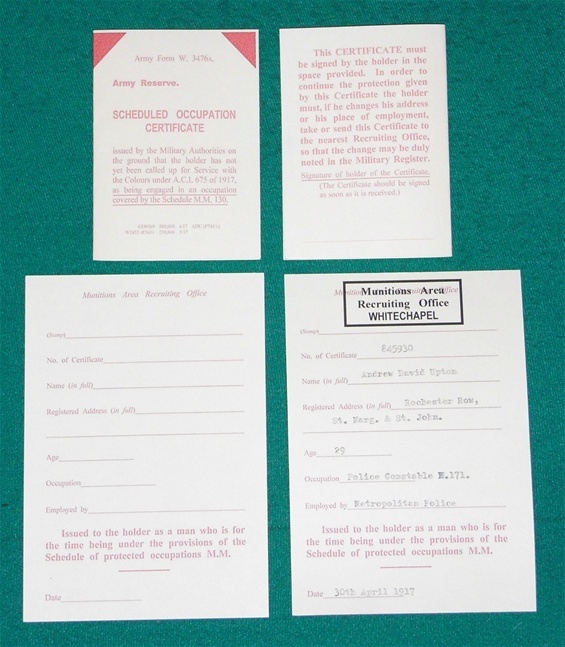 This is a reproduction of Army Form W. 3476A, the Army Reserve Scheduled Occupation Certificate. Issued to those doing work that was deemed more important to the running of the country than if they were in military uniform. These are copied from an original in my posession, and cut to the correct size. Each certificate costs £2.00, plus postage and packaging. Please note I can supply these with typed details to your specification and/or any desired Munitions Area Recruiting Office overstamp to the top for an additional £1.00. 1917 Scheduled Occupation Certificate - photo shows front, reverse, and interior, price is for one. Bottom right shows an example filled and overstamped to Whitechapel (certificates supplies blank unless otherwise requested).